Classic Rococo-style bedrooms are the epitome of elegance and luxury. Dramatic, chic, and flirty, they are still popular all over the globe. Actually, Rococo style/or late Baroque/ emerged in France in the 18th century and influenced not only interior design, but lifestyle in general. Its name comes from the French words “rocaille”, which means “stone” and “coquille” meaning “shell” and symbolizes the ornate asymmetry of this decorating style inspired by the curves of the shells, and, broadly speaking, of the trees, flowers, and clouds. This highly ornamental style with massive furniture, artwork, and accessories /also referred to as “the style of Louis XV»/ reflects the desire to taste the pleasures of life as well as to demonstrate high social status, excellent taste, and love for details. You like luxury and glamor? Creating an opulent bedroom is your dream? 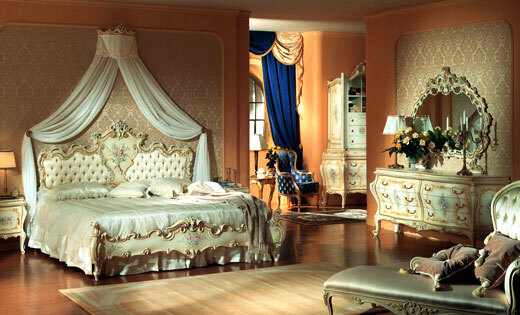 Then, a Rococo-inspired bedroom will definitely be your choice! Although it would be challenging to fully recreate a Rococo-style bedroom/mainly in terms of budget/, incorporating period furniture replicas, patterns, colors, and accessories can help add some Rococo magic to your bedroom. Generally, when it comes to creating graceful, refined spaces with touches of mystery, as this style is all about comfort, splendor, sensuality, finesse, and pleasure, always consider adding Rococo-inspired details. Rococo style epitomizes the whimsical ambiance of boudoir life, it is feminine, intriguing, flamboyant, ornate, and dramatic. Rococo-style comfortable, elegant bedrooms are usually in light shades of purple, blue, green, and pink as well as in peach, yellow, pearl, and cream combined with touches of gold. Generally, the pastels-and-gold combo is a signature feature of this style. This style is a celebration of smooth lines and sinuous oval, rounded forms – from tables to cabinets to area rugs to chair seats and backrests. In the picture above, an absolutely mind-blowing bedroom in soft, pastel colors. 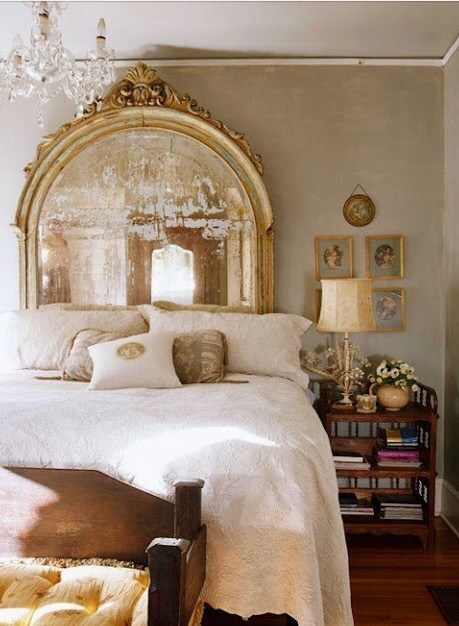 Ornate furniture, an exquisite mirror, a round area rug, matching sconces…Pure perfection! Walls are either upholstered or decorated with wallpaper or wall panels. Moldings/such as scrolls, shells, or cupids/and frescoes are a common décor element, which helps beautify bedroom walls. Above, an adorable Rococo-style bedroom in pastel colors. A gorgeous, beautifully ornate bed, a stunning ceiling and walls, floral-patterned pillows and an area rug, eye-grabbing lights…Definitely a covet-worthy space! Note that Rococo décor motifs are inspired by Chinese, Italian, Gothic, and Oriental influences. Chinese-inspired décor items, such as screens, fans, and tapestries add extra touches of luxury and mystery to Rococo-style bedrooms. Above, a breathtaking bedroom in different shades of blue. Walls upholstered in silk, ornate ceiling and furniture, a glamorous crystal chandelier, beautiful drapes, a wow-worthy bed…Definitely every single item is a piece of art! What a bedroom! As already mentioned, Rococo-style spaces are dominated by curved, rounded forms, so, the transition between the walls and the ceiling should also be smooth and rounded. This can be achieved by creating a general pattern or a fresco on the walls and the ceiling. Large hand-woven area rugs cover the floors/ usually made of solid wood or natural stone/ to soften and balance the space. 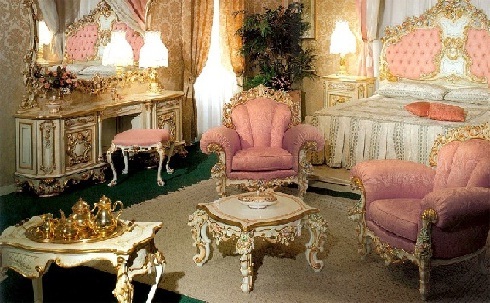 As for Rococo furniture, it is comfortable, elegant, and richly decorated with detailed accents. Made of natural wood/mahogany is a favorite choice/, gilded and upholstered in leather or luxury, refined fabrics/ brocade, silk, satin, or velvet, usually with floral, pastoral, or mythological motifs/, furniture pieces are with curved sinuous silhouettes to complement the walls and ceilings. Carved rounded furniture legs, armrests, and bed headboards as well as embroidered fabrics are common for this design style. Note that being an embodiment of boudoir life with its femininity, mystery, intrigue, and romance, cabinets, cupboards, and escritoires usually have hidden drawers and invisible partitions. In the picture above, a fascinating Rococo-style bedroom. A partly upholstered, gorgeously decorated headboard, ornate furniture legs, upholstered armchairs, a dressing table complemented by a beautifully framed mirror…So graceful and sophisticated! Rococo-style interiors incorporate massive, artistic accessories – from mirrors and paintings in gilt frames to small sculptures, crystal chandeliers mimicking candelabra to delicate vases, embroidered throw pillows, screens, and porcelain sets. Opulent, detailed, and fascinating, they complement architectural details and add extra doses of luxury and glamor to the space. Note that mythological images, such as cupids, nymphs, and Dryads are also used to embellish Rococo-themed interiors. Above, a magnificent Rococo-themed bedroom. A mind-blowing headboard adds so much charm and personality to the space. Highly appreciated for its asymmetry, fluidity, grace, whimsy, and ornate walls and furniture, classic Rococo style can be updated to modern aesthetics and help create chic, elegant, sophisticated, luxury bedrooms. If you like bedrooms that go far beyond pure functionality and want to add touches of French charm, finesse, and demure luxury, then you can opt for a Rococo-style bed, it will immediately turn into the focal point of the space. Of course, to create a balanced, harmonious space, you need to add replicas of other period pieces of furniture. In order to not overdo the space and keep its modern look, try to minimize opulence. Above, a Rococo-themed bedroom with attention to detail. A stunning elegantly carved bed complemented by luxury bedding and refined pieces of furniture and accessories lend this space a graceful, sophisticated look. However, there are other much affordable ways to recreate the atmosphere of Rococo interiors, such as adding patterns and accessories characteristic for this design style. When used tastefully and sparingly, Rococo-inspired décor elements add whimsy, personality, and touches of drama. A creative approach is to mix Rococo-style textures, patterns, and gold accents with modern décor items to lend your bedroom a charming Rococo look with a modern twist. Generally, anything from pieces of art to beautifully framed mirrors to chandeliers to curtains to furniture pieces with Rococo-inspired reliefs can do the job. In the picture above, a lovely bedroom in soft colors. 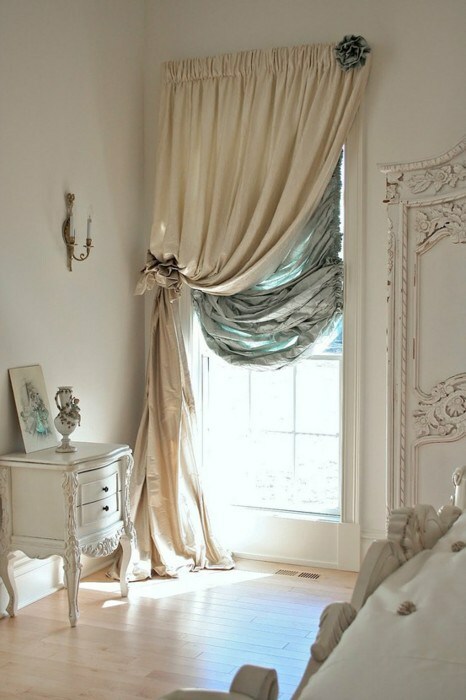 Absolutely gorgeous curtains add so much charm, romance, and atmosphere to the space! Above, gorgeously framed mirror serves double in this bedroom: on the one hand, it creates a sense of space and on the other- makes a unique headboard. In addition, a chandelier adds extra glam. Definitely a creative way to introduce Rococo touches! Above, an adorable master bedroom. 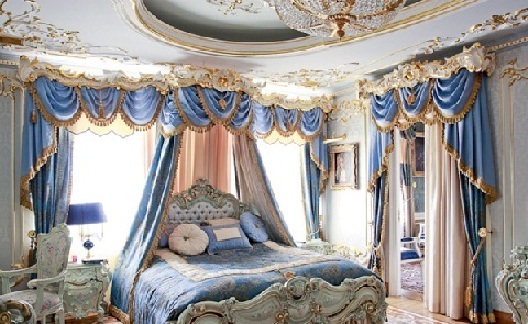 A stunning bed with a unique headboard, exquisite pieces of furniture, an absolutely mind-blowing mirror, beautiful bed curtains and window treatment add Rococo-inspired touches. Rococo style is a complex blend of elegance, femininity, chic, luxury, comfort, romance, mystery, and sophistication and can be used to decorate any kind of space. Rococo opulent, graceful interiors are with smooth lines and rounded forms and in soft colors combined with touches of gold. With intricately decorated walls and ceilings, magnificent pieces of furniture, embroidered fabrics, and abundant, luxury, detailed accents, Rococo spaces have an unmistakable look. Furthermore, Rococo style is still a source of inspiration for contemporary designers. However, classic Rococo-style bedrooms their curved lines, massive ornate beds, unique headboards, elegant nightstands and dressing tables, large ornamental mirrors, and luxury bedding are the epitome of refinement, femininity, drama, glamor, and chic. If you like their look, there is an array of affordable, creative, wonderful ways to add Rococo-inspired touches to your bedroom.